The Digital Place Based Advertising Association (DPAA) has lined up a mighty impressive bunch of speakers for its annual Video Everywhere Summit in New York on November 1, 2017. Sharing the stage at the all-day event – a big part of New York Digital Signage Week (October 30-November 3) of course will be thought leaders from leading brands and agencies, along with prominent journalists and authors. The Summit, to be held at the iconic Roosevelt Hotel, will bring together nearly 800 delegates representing brands, agencies, digital out-of-home networks, ad tech, mobile/location companies, data firms and others from the full spectrum of multi-screen advertising. The Summit agenda features leadership talks, case studies, networking events and experiential exhibits. The Video Everywhere Summit is the largest one-day event dedicated to multi-screen engagement, mobile/location data and the role of digital out-of-home advertising in today’s fast evolving media ecosystem. Barry Frey, DPAA President & CEO, will lead the Video Everywhere Summit and conduct one-on-one interviews with select speakers. 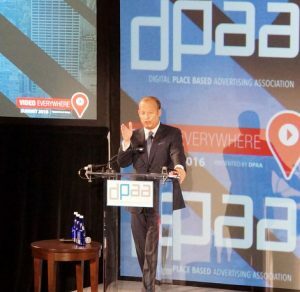 Barry Frey, DPAA President & CEO told us “There is an incredible amount of activity and energy in the digital out of home space and we plan to touch on many of these exciting areas at this year’s Summit. These include the infusion of data and programmatic into the DOOH ecosystem, and insights from advertisers and agencies on how they are making digital out-of-home an integral part of their video mix”. This year’s Video Everywhere Summit will once again feature an experiential exhibit hall, The Intel Hall of Innovation, where DOOH networks and technology companies will display the latest in digital out-of-home content and tools to reach on-the-go consumers. A first look at the Summit sponsor list includes Adspace, Ayuda, BroadSign, Captivate, Clear Channel Outdoor, Intersection, Michelman & Robinson LLP, PlaceIQ, Reflect Systems, Sito Mobile, Verifone Media, Vistar Media, xAd and Zoom. A limited number of sponsorships are still available. The historic Roosevelt Hotel, known as ‘The Grand Dame of Madison Avenue’ is the official hotel of New York Digital Signage Week. Attendees to the Video Everywhere Summit or any other of the week’s events are eligible for preferred hotel rates. These rates and all Summit information can be accessed here. This entry was posted on Tuesday, June 27th, 2017 at 00:58 @082 and is filed under DailyDOOH Update. You can follow any responses to this entry through the RSS 2.0 feed. You can leave a response, or trackback from your own site.